Do you remember when I bought my bar-height table for the mobile home back in July? 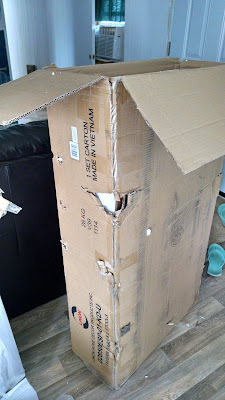 The box arrived with holes and chunks missing. The instructions said to contact the manufacturer instead of returning it to Home Depot, so I did. 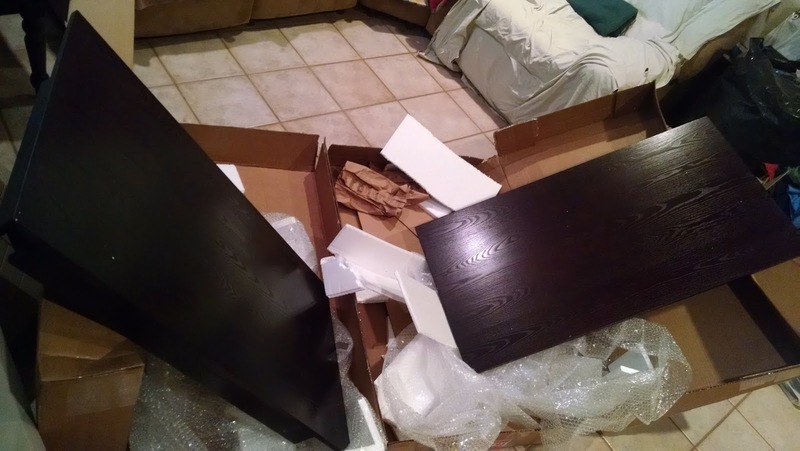 Since it was the table top that was damaged, they said they would send a replacement but that it was back-ordered. I assumed that meant that they wouldn't do anything, but they took my information and I forgot about it. That was around 8 months ago. Yesterday, I arrived at the house to water the plants, check on the quail, get the mail and fill up my water bottles. There were two large boxes under the carport. First, I checked the name because I thought they might be at the wrong house. Nope. Then I called my mother to see if she had something shipped to my house. Nope. Then it dawned on me. The table top. But why were there two boxes? For a moment, I thought they might have shipped me two whole new tables. I opened the first one. It was a very well wrapped table top. I opened the second one. It was another very well wrapped table top. We use the original damaged table top at the mobile home. 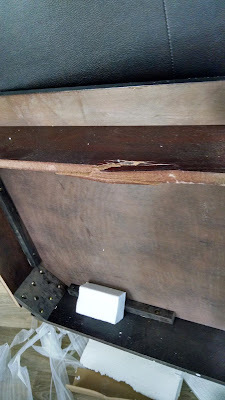 It sits against the back of the couch and has a table cloth so the dent on the side is not noticeable. Now I have two more table tops. Well, since I have to buy legs, I guess I could make them any height that I want. I could have a matching coffee table and computer table. More projects! But more cost for legs. For now, they will sit in my living room taking up space. I haven't exactly embraced tiny house minimalism just yet, so I just keep everything for now. Downsizing is on my to-do list for next year. I know! I was glad that they said not to take it back to the store because I never would have gotten it back in the box. Plus, I needed a table back in July. Now I need to find a place to store the two tops until I have time to give them legs. The boat trip from the Vietnamese factory must be really slow.